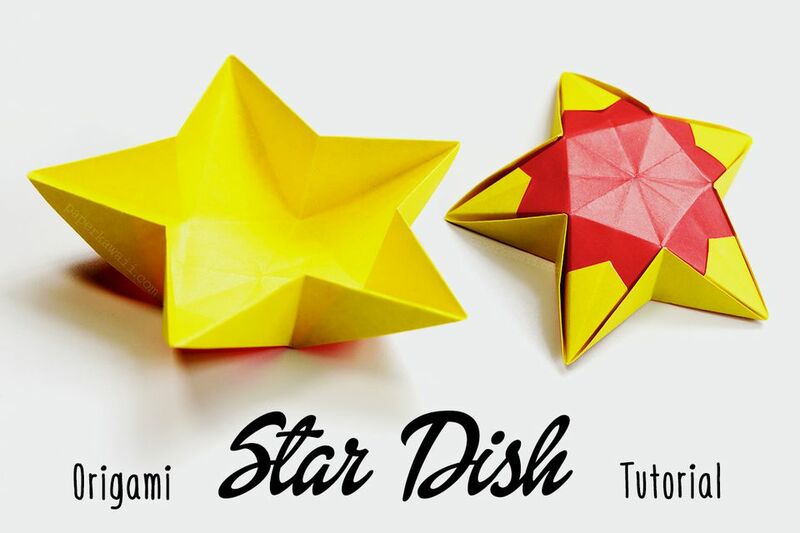 Learn how to make a super cool origami star that can be used as a dish or hung as a decoration for your Christmas tree! This origami model is created from a pentagon, which I'll show you the easiest way to cut from a square sheet of paper―it's easier than you think! If you use paper with different colors or patterns on each side, you will get a pretty cherry blossom design either on the outside or inside of the bowl. If you'd like to make an even simpler origami dish, check out the easy origami candy box instructions which are suitable for kids to make! Start with the color you'd like on the inside of the bowl facing up. Fold the bottom edge up to the top. Bring the top left corner down to the center and make a small mark at the center. You should have a small crease like this. Bring the bottom left corner up to the center top, making another little mark. Fold the bottom right corner to the middle of the two creases meet in the middle. Now fold the left edge of the front layer to align with the right edge. Fold the bottom left corner to align with the left edge of the front layer. You now need to fold the left section behind. Align the edges as best you can. Cut along the front layer's top edge. Unfold the paper, you should have a nice pentagon! Fold in all 5 points as shown. You should have this cool star. Fold the 5 corners inwards again. You should have another star! Unless you want a sakura design on the inside of the bowl, flip the paper over, and fold where indicated. You will be folding like this, aligning with the flaps underneath. Once all the sections are folded, you can push the sides ​into form the dish.